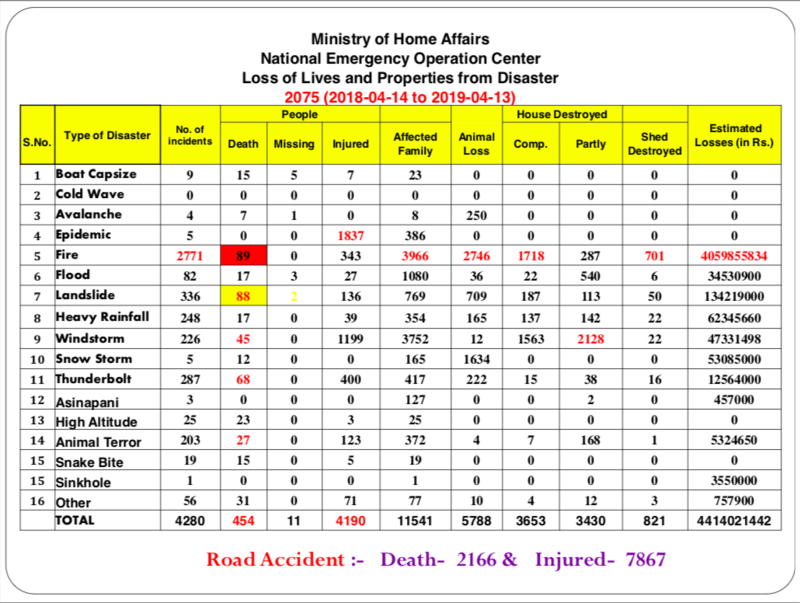 The "LOSS OF LIVES AND PROPERTIES FROM DISASTER 2075 (2018-04-14 TO 2019-04-13)" is published by Ministry of Home Affairs and can be found in the Publications of the Nepal in Data Portal. The information contained in this publication can be accessed via the Data Tab of the Nepal in Data Portal by selecting the section Energy & Environment. This publication is in English and is published in pdf format. 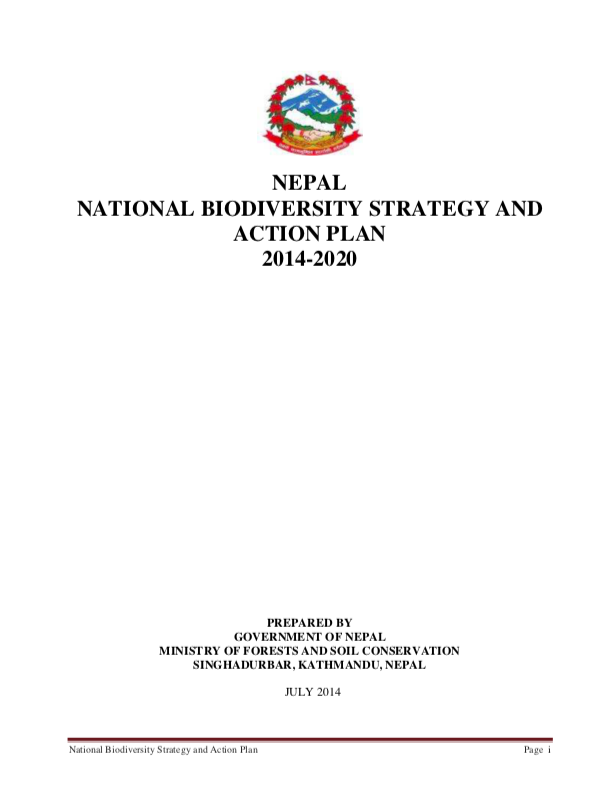 The "NEPAL NATIONAL BIODIVERSITY STRATEGY AND ACTION PLAN 2014-2020" is published by Ministry of Forest and Environment and can be found in the Laws, Policies and Strategies of the Nepal in Data Portal. The information contained in this publication can be accessed via the Data Tab of the Nepal in Data Portal by selecting the section Energy & Environment. This publication is in English and is published in pdf format. The "प्रदेश ७: आर्थिक वर्ष २०७५/७६ को बजेट वक्तव्य" is published by Ministry of Economic Affairs and Planning and can be found in the Publications of the Nepal in Data Portal. The information contained in this publication can be accessed via the Data Tab of the Nepal in Data Portal by selecting the section Public Finance. This publication is in Nepali and is published in pdf format. 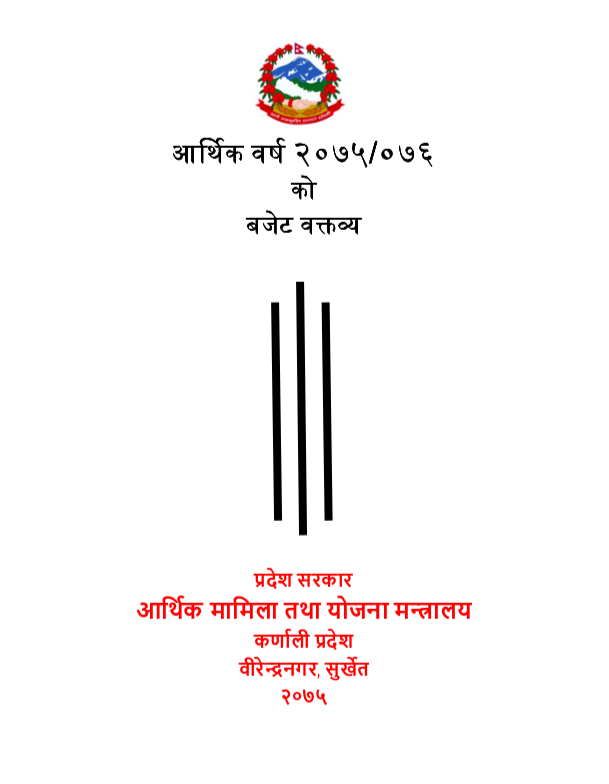 The "प्रदेश ६: आर्थिक वर्ष २०७५/७६ को बजेट वक्तव्य" is published by Ministry of Economic Affairs and Planning and can be found in the Publications of the Nepal in Data Portal. The information contained in this publication can be accessed via the Data Tab of the Nepal in Data Portal by selecting the section Public Finance. This publication is in Nepali and is published in pdf format. 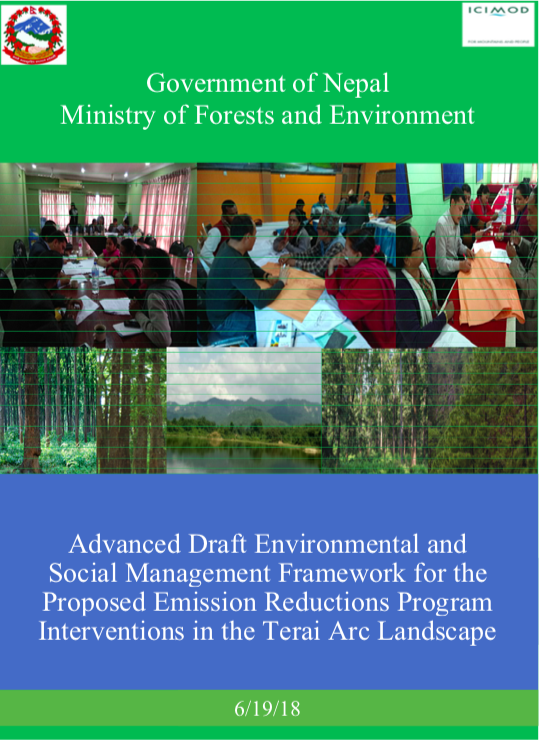 The "ENVIRONMENTAL AND SOCIAL MANAGEMENT FRAMEWORK FOR THE PROPOSED EMISSIONS REDUCTION PROGRAM INTERVENTIONS IN THE TERAI ARC LANDSCAPE" is published by Ministry of Forest and Environment and can be found in the Publications of the Nepal in Data Portal. The information contained in this publication can be accessed via the Data Tab of the Nepal in Data Portal by selecting the section Energy & Environment. This publication is in English and is published in pdf format.